I don’t know, maybe we should consider this progress. When a party drifting from late-term abortion towards infanticide decides it’s better not to conceive in the first place, that feels like a win all around. The newsiest part of this isn’t the bit about rethinking having kids, a common enough sentiment among climate-change doomsayers. It’s the part at the end where Ocasio-Cortez preemptively rejects more modest global-warming legislation that might eventually come before Congress. Like I said yesterday, the irony of crediting her with “jumpstarting the conversation” on the environment is that she and other Green-Party-style leftists aren’t interested in a conversation. The Green New Deal isn’t a maximalist opening offer made in the expectation that it’ll be negotiated down to something more realistic. It’s take-it-or-leave-it. The fact that Democratic fans keep comparing it to war mobilization captures the spirit of it: You wouldn’t declare war, as the United States did in World War II, and immediately begin haggling over a cap on the number of troops to be deployed. You’re facing an existential threat. You do what you need to win. There’s no “conversation,” at least not with the party’s Ocasio-Cortez wing. It’s this or oblivion. 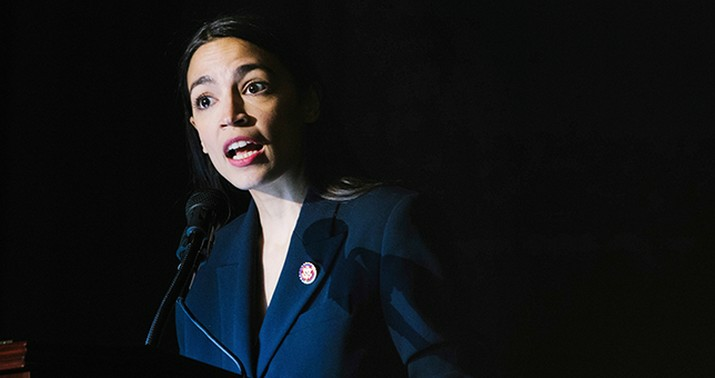 Which is to say, when the day comes that Democrats finally have majorities in both chambers of Congress and one of their own in the White House, whatever green legislation actually emerges is a cinch to be opposed by AOC. The perfect is the enemy of the good, or mediocre. That’s what ideological purity means. I agree with Jeryl Bier, anyway. She should drop the “some people think” hedging when discussing this. If she believes that Congress’s failure to pass the GND is so dire that people should decline to breed because of it, say so. Let’s jumpstart that conversation too, preferably right around the time next year’s campaign starts heating up. Exit question: Who’s going to pick up the $100 trillion or whatever tab for her agenda if young Americans stop having kids? Oh, right, right. Gotta hand it to progressives — they’ve got it all figured out.